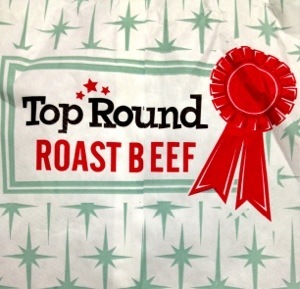 Top Round opened to fanfare last year as a cool “better version of Arby’s.” Even people who grew up on the east coast, where roast beef sandwiches like those at Top Round are common, said as much. But c’mon — talk about damning with faint praise. These are really much more like the roast beef sandwiches at Phillippe’s, except better. Simple. Quality ingredients. Tasty. But I’m not from the east coast, so this doesn’t really dredge up nostalgia. On its own merits, the sandwich is good, but not life-changing. This place is mostly notable for its retro style. So enjoy the pictures after the jump and take a quick nostalgia trip.